Heat closed contact grill 5 minutes. Spread one side of each slice of bread with pesto. 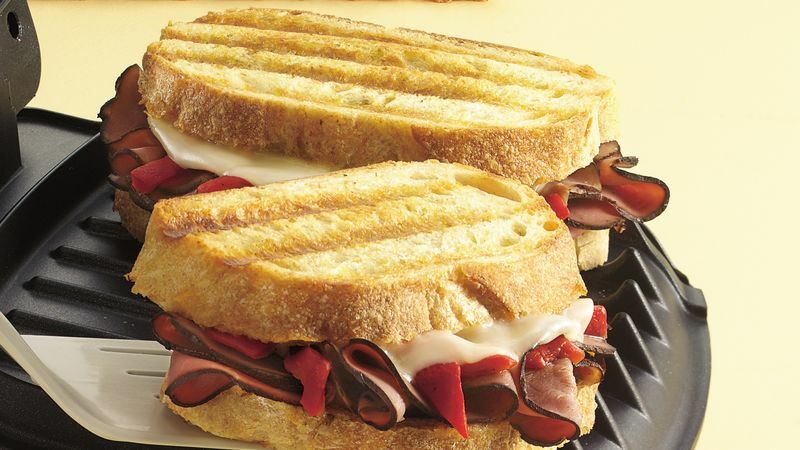 On 2 slices of the bread, layer beef, roasted peppers and cheese; top with remaining slices of bread, pesto side down. Brush outside of sandwiches with butter. When grill is heated, place sandwiches on bottom grill surface. Close grill; cook 3 to 5 minutes or until bread is toasted and cheese is melted. Refrigerate the unused pesto; it adds great flavor to soups and sandwiches. For longer storage, freeze it in small portions in tightly covered containers.